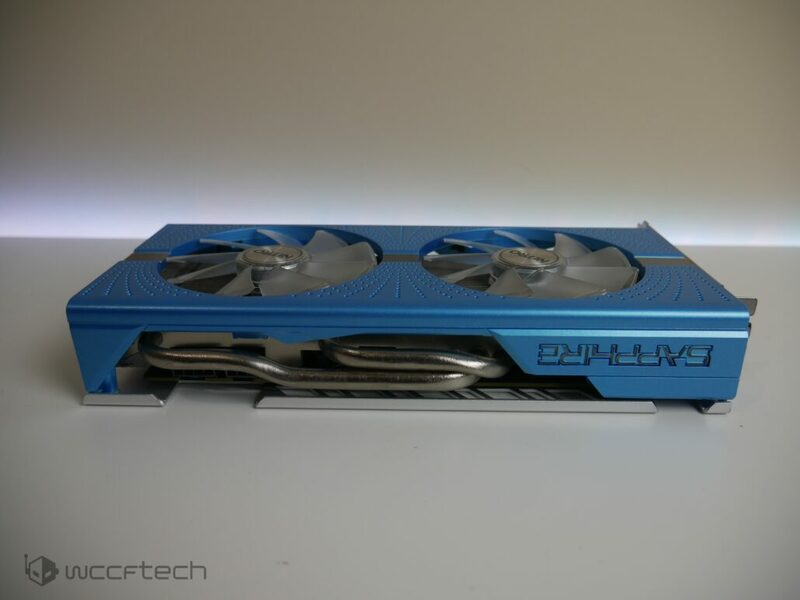 SAPPHIRE Nitro+ Radeon RX 590 Special Edition - Polaris Rides Again. 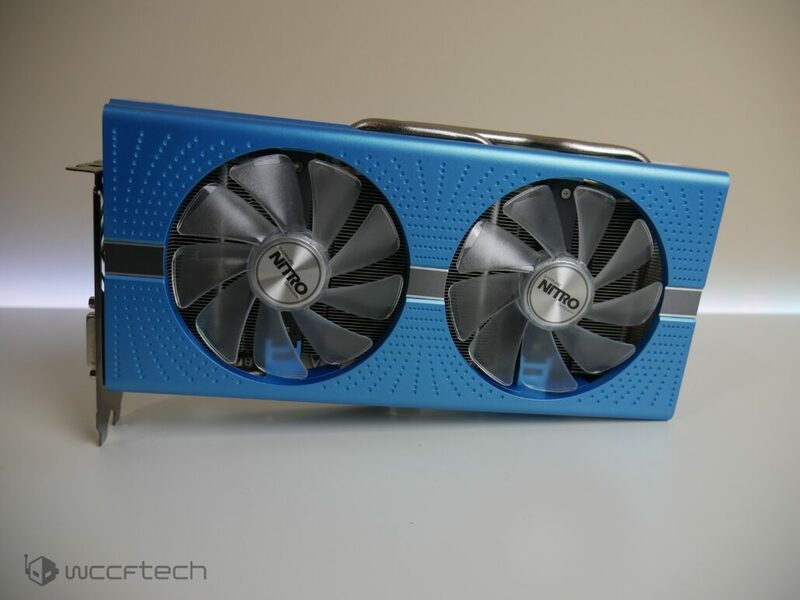 Polaris 30, the RX 590 is Polaris 30 in the most simple of descriptions. But what does that mean? Well, first off with what it isn’t. 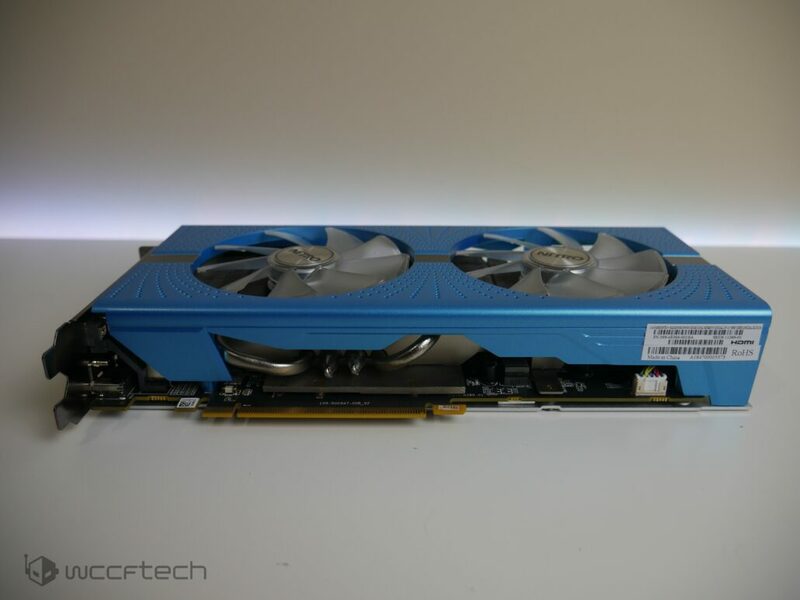 The RX 590 is not a larger Compute Unit count variant of the RX 480/580 as it still carries 2304 Stream Processors. Memory configuration stays the same with 8GB of GDDR5, no G5X here, but they did restrict the RX 590 to only being made in 8GB variants so no 4GB model to be had. So, what’s the big fuss? Manufacturing process change has prompted a new model. The RX 480/580 were made on GlobalFoundries 14nm process nodes while the RX 590 is made on their 12nm node (which by design allowed AMD to move the existing 14nm designs over without redesign thanks to being the same optical size). Moving to the 12nm node allowed for a bit more headroom on the clock and power efficiency, which we’ll take a look at later in more detail. 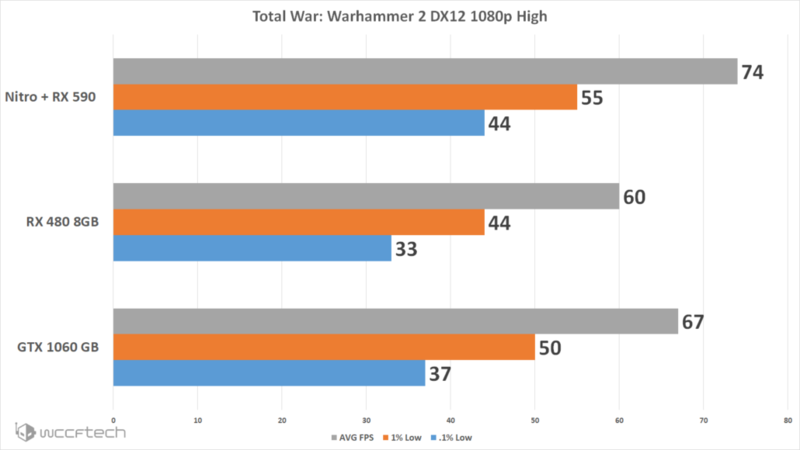 They may have bumped the TDP of the RX 590 up to 225w but in doing so they’ve allowed for a substantially higher core frequency of well over 1500MHz which was what only the best of the best Polaris 20 chips could do allowing for over 7 TFLOPS of peak compute performance out of the box. While I still would have preferred to see this card get a nomenclature more akin to a RX 580+ or RX 585 since the core specifications outside of node, power, and clock speeds have stayed unchanged I think we’ll still find that the RX 590 is a welcome addition to the Polaris family. 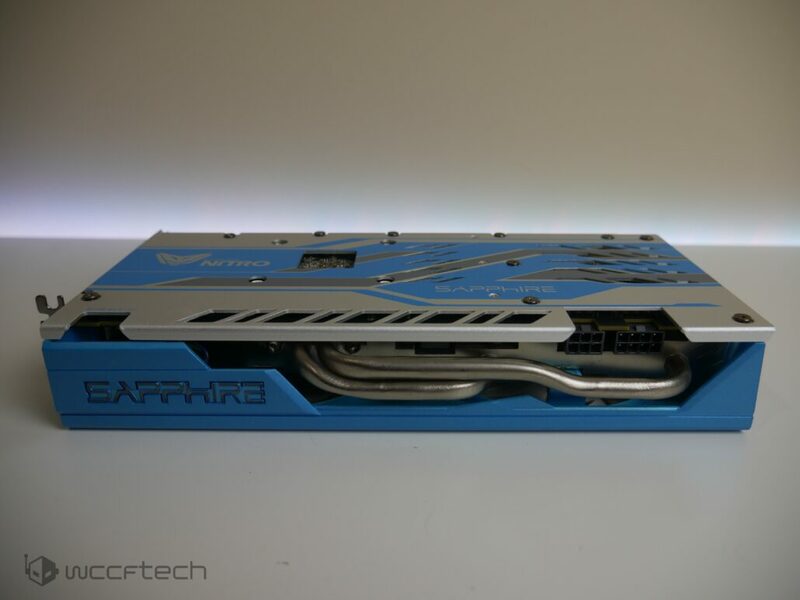 Something major to get out of the way, if the SAPPHIRE Nitro+ RX 590 looks familiar in design then you’re not crazy. This card retains the core design from the RX 500 series, and that’s a good thing. When we took a look at the RX 570 at launch we found the build of the card to be absolutely wonderful. The RX 590 is no exception to this. 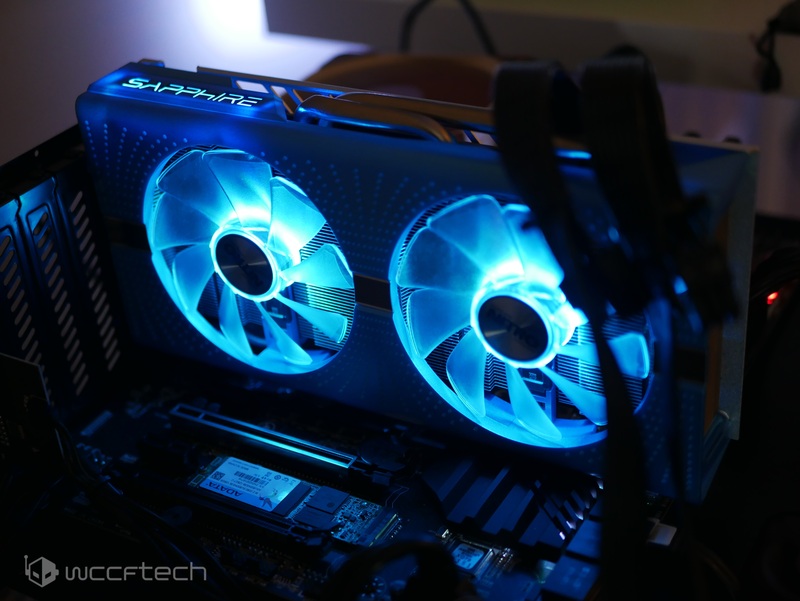 The SAPPHIRE Nitro+ RX 590 Special Edition get’s the solid 4 heatpipe design with 2x8mm and 2x6mm heatpipes snaking though the full size heasink kept cool by a pair of blue lit dual ball bearing fans that make up the Dual X cooling solution. Being designed for 300w of cooling this setup has no trouble taming the new higher TDP Polaris 30 chip as you’ll see further down. 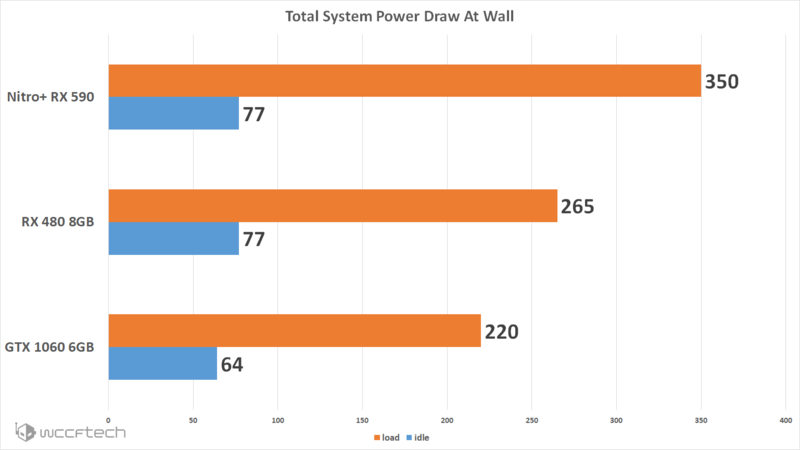 Power design is handled by 6 phase 50amp board design along with Black Diamond Chokes and polymer capacitors as before with the preview 500 series Nitro+ board design with the same 8+6pin power connections that are inverted for ease of installation and removal. The included Dual Bios (wish everyone did this) gives you the default options of Nitro Boost settings or Silent Settings, although it’s so quiet already not sure the silent settings is needed outside of perhaps reduced power consumption. 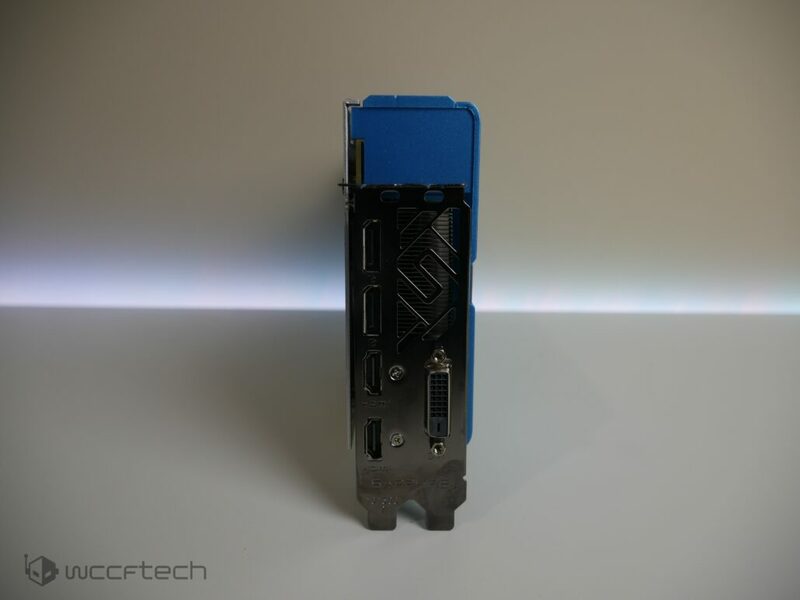 The I/O of one DVI-D, 2xDP 1.4, and 2xHDMI 2.0 ports along with the heatsink shroud and backplate mirror that of the Nitro+ RX 570 and 580, but this time with the Elvis loving Metallic Blue. I’m going out on a limb here and saying that the color might be a turn off for a lot of people who would much rather have seen this card launch with the same, or even make it metallic, black shroud and backplate design as before. I get they wanted to differentiate this model, and while it does look good on it’s own I don’t see many builds this looking right at home in. 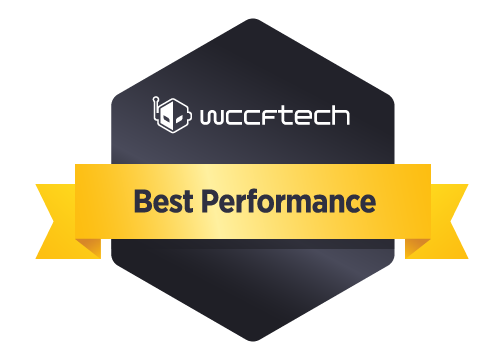 All of the testing was done on our Intel Z370 test bench powered by a 5GHz Core i5 8600K. We ran all tests involving DX11 through 3 paces and averaged the results of all metrics to come to the final numbers. For DX12 and Vulkan we used the latest release of OCAT at the time and ran the resulting file though our algorithm that extracts the metrics for measurement. The results are presented as Avgerage FPS that represent where the average frame rate fell over the course of the test, 1% Low which represents the lowest 1% of frames, and then the .1% low represents the bottom .1% frames. 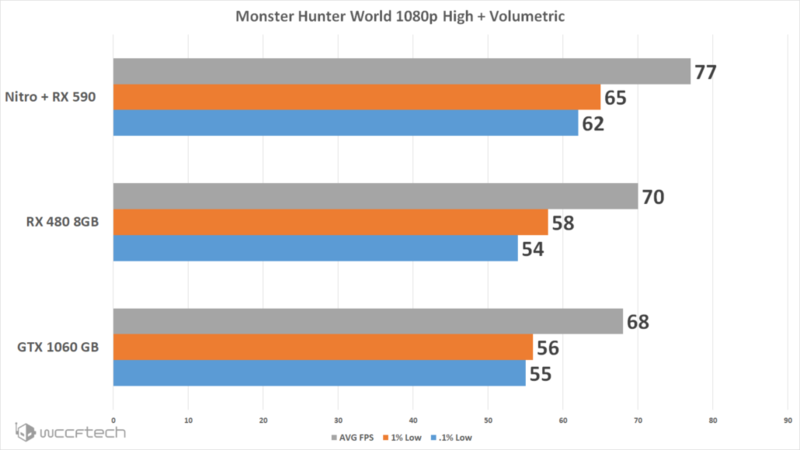 These metrics give a better understanding of overall performance rather than representing the absolute minimum frame rate as that could potentially be a random outlier, but know that the .1% can still be effected by asset loading during runs. We are comparing the RX 590 to the GTX 1060 6GB FE and the Radeon RX 480 8GB today. 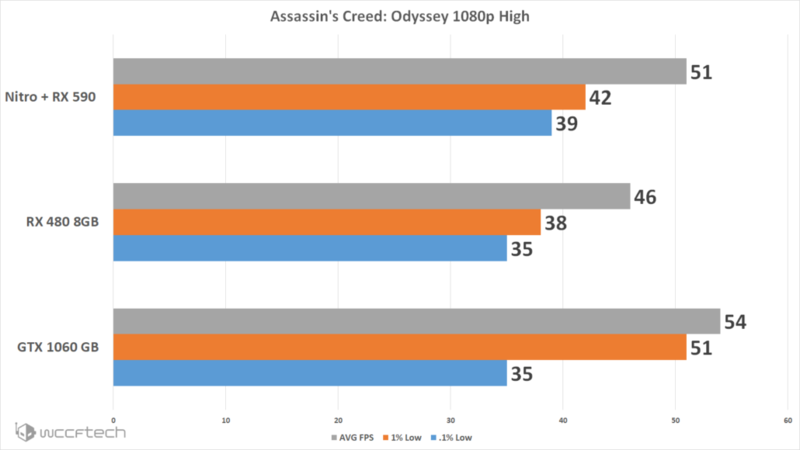 While there will be some who are sour about the absence of the RX 580, and that’s understandable, we’re looking at where this card performs in relation to baseline metrics. The RX 480 8GB is representative of when Polaris hit the market and can show us a good then and now comparison without a lot of extras surrounding it, and the GTX 1060 6GB FE serves as a solid baseline metric for 1060 performance. The Radeon RX 590 is marketed as the ultimate 1080p gaming card. 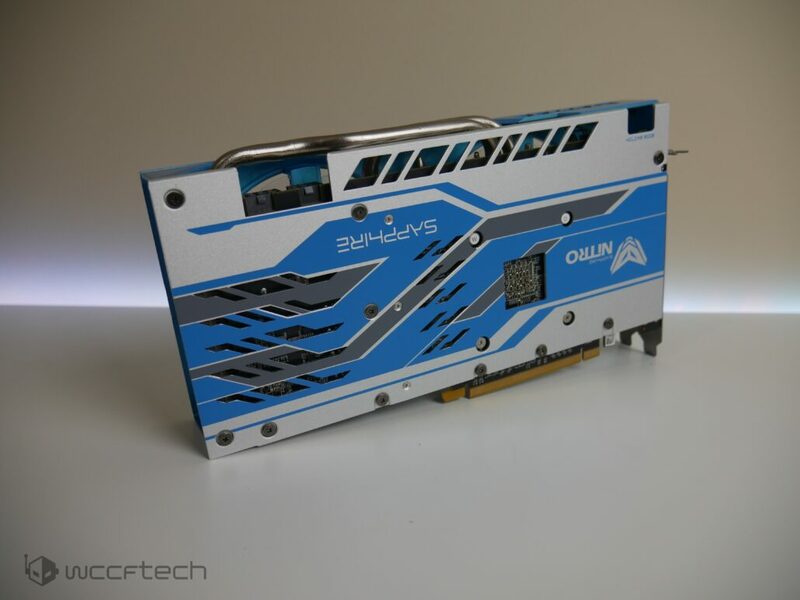 While I’m sure there are many that would argue the GTX 1070 or the Vega 56 would happily take that place those cards were designed and marketed to the 1440p gamer. 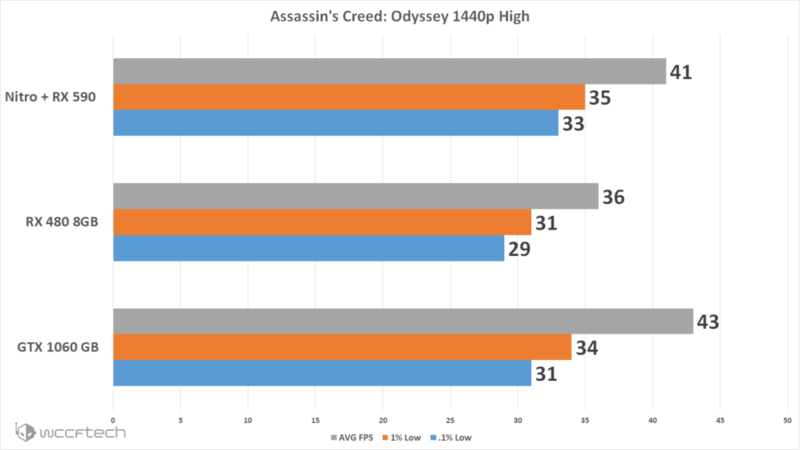 At 1080p the RX 590 absolutely dominates the previous Polaris GPU and walks away with a solid performance lead over the GTX 1060 6GB FE, even comes close to matching it in Assassin’s Creed Odyssey which is surprising due to NVIDIAs dominance in that title across all tiers. 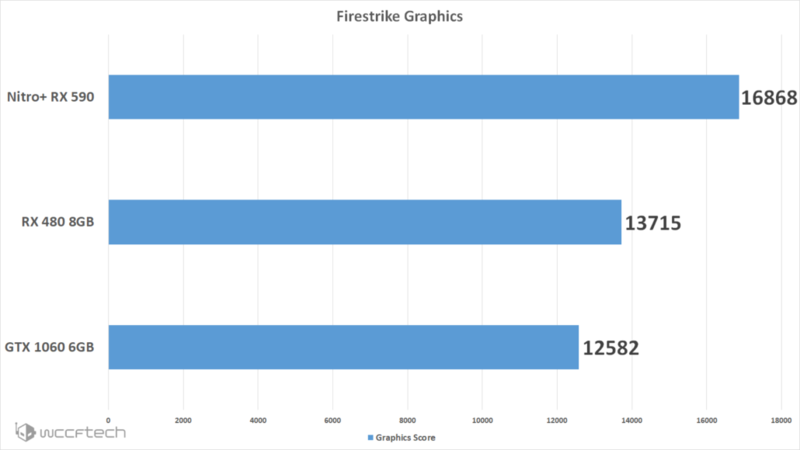 The SAPPHIRE Nitro+ RX 590 saw zero core frequency fluctuations through all these tests, it maintained it’s full 1560MHz core clock at all times. The RX 590, much like the RX 480 8GB is also marketed as being 1440p capable. 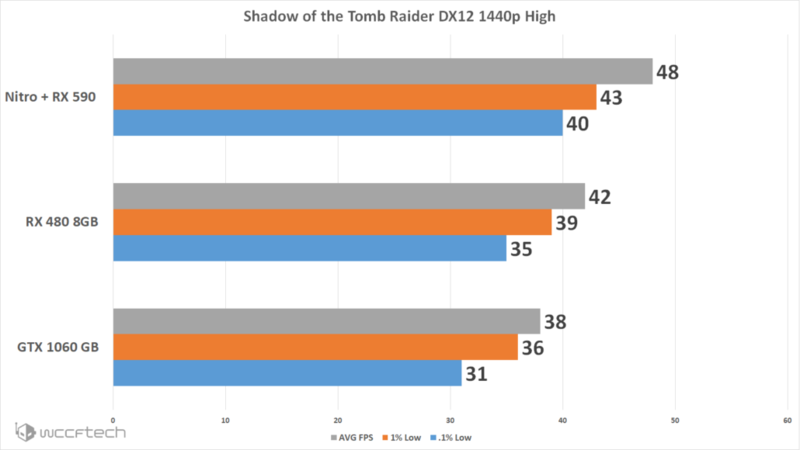 I found in early testing of the RX 480 that it was able to game at 1440p but with a bit more compromises than I really wanted to take for my personal gaming experience. So with the added beefcake of the RX 590 I was really hoping to see the 1440p gamer a bit more satisfied, but still came up just a bit shy. It is however a much more preferable experience than the cards it’s lined up against today. I would see it comfortably powering along 1440p gaming at Medium settings and paired with a Freesync display delivering on that 1440p capability. 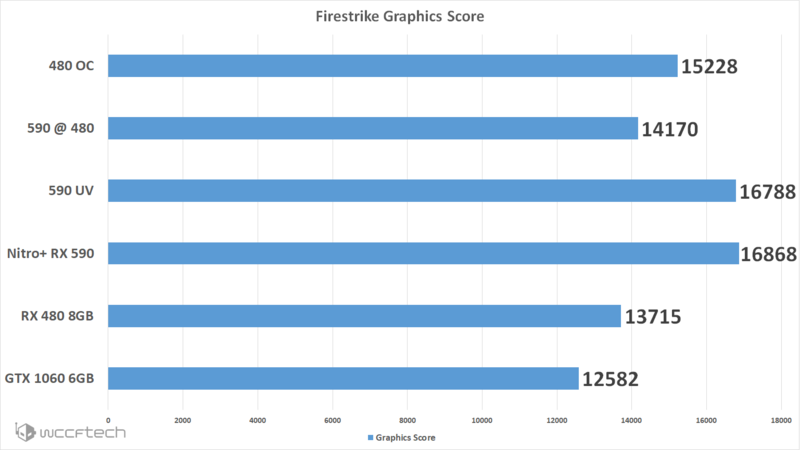 The SAPPHIRE Nitro+ RX 590 saw zero core frequency fluctuations through all these tests, it maintained it’s full 1560MHz core clock at all times. Over time I’ve come to limit my synthetic tests as they’re simply not that indicative of gaming performance but still server as a good identifier of how cards distance themselves in raw power figures. The Dual X cooler on the SAPPHIRE Nitro+ RX 590 is at it’s best when you give it all it can take. 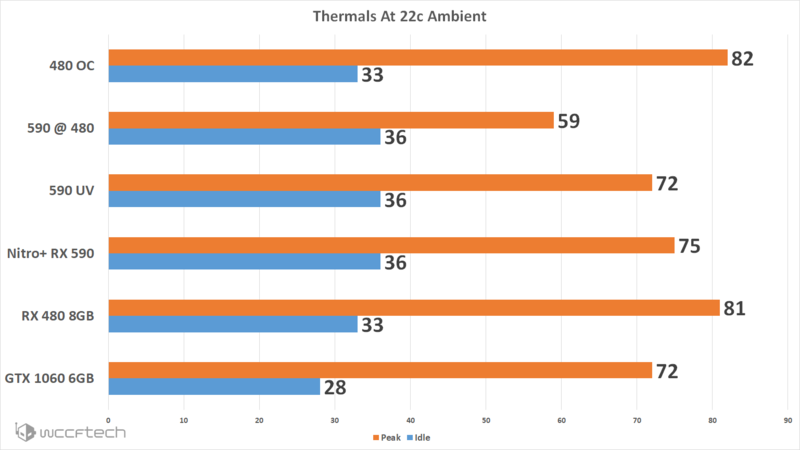 Both the thermal and power draw numbers below were taken after 30 minutes of looping the 3DMark Firestrike Combined Test. This gave the card enough time to equalize on thermals, core clock, and power draw. 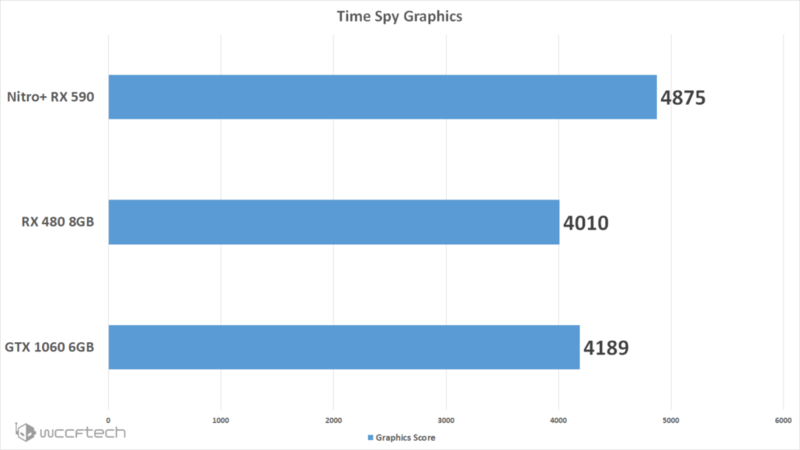 I must reiterate that through these tests The SAPPHIRE Nitro+ RX 590 saw zero core frequency fluctuations through all these tests, it maintained it’s full 1560MHz core clock at all times. 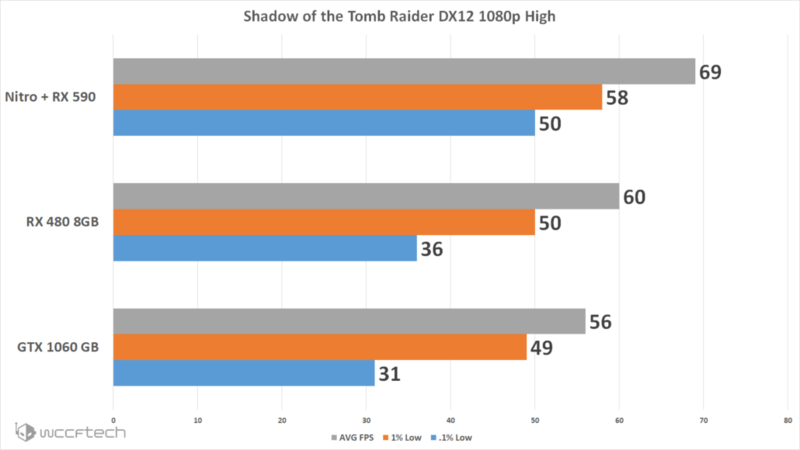 Since the launch of the RX 480 we found that Radeon cards benefited greatly from undervolting. In fact they tended to benefit more from this than overclocking in terms of overall performance. 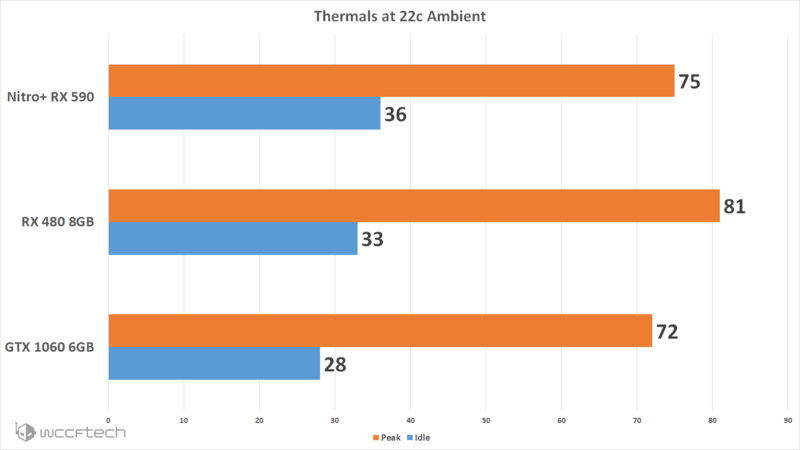 So rather than focusing on overclocking performance we wanted to see how performance, power, and thermals reacted when fine tuning the Polaris 30 GPU. We did this in a few ways starting with taking our baseline performance from earlier. Then we undervolted the P states down to when they crashed at 1050mV then bumped them up to 1075mV for stability and reduced the power limit to -10% as any lower would cause the clock rate to dip on occasion. The to see where the RX 590 would be overall if it matched the RX 480 clock rates, so we reduced the core clock down to 1266MHz and the memory down to 2000MHz while leaving the voltage to Auto and reducing the power limit to -25%. Finally we needed to see what an overclocked RX 480 would pull overall and our unfortunately only gets to 1325MHz before becoming an unstable mess, but the memory would get up to 2250MHz so that was a win for it. At the end of it all the 12nm Polaris 30 chip is a bit more efficient than the stock configuration would lead you to believe, it unfortunately sees a bit of runaway once you start cranking the speeds on up. But it is nice to see that if you wanted to tweak things down you can cut off a bit of heat and power draw while still retaining most all this cards performance. Or if you’d rather listen to me go on for about 10 minutes regarding these tests hit the video below. This did not start out as something I thought I would find terribly interesting, Polaris has been around for quite some time at this point. But, what I was not expecting was to have as much fun tweaking about with core settings. Out of the box this is the most powerful Polaris has ever shined, but like a bright star it’s consuming a lot of energy to do so. 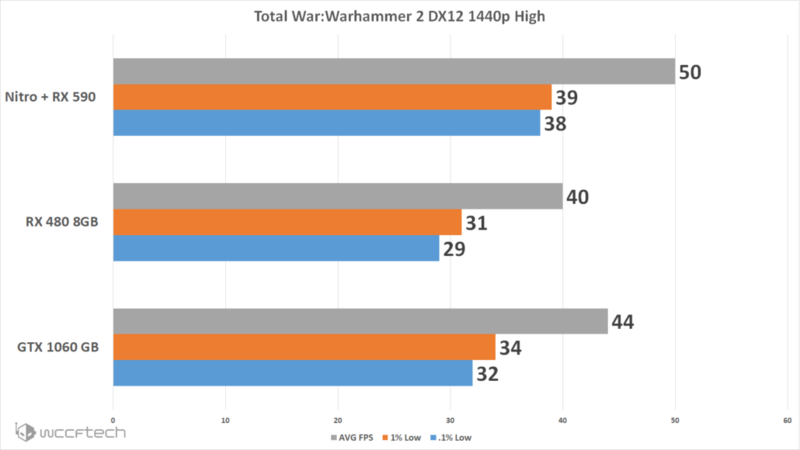 The performance uplift since the RX 480 came on the market is really something to behold seeing how far AMD has been able to stretch the silicon. 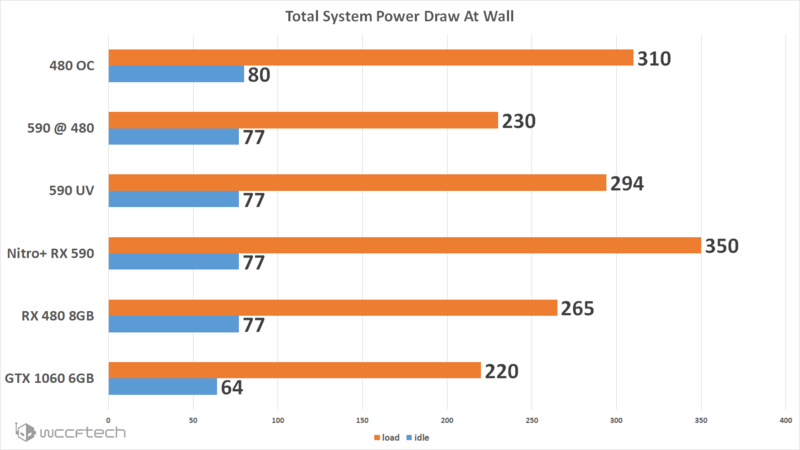 Tweaking the power limit and voltages showed where the node refinement and reworking of the core design improved, if Polaris 10 had launched with this much headroom in clocks and efficiency I think the story of Polaris had gone much more in AMDs favor. While I’m still not sold on calling it a x90 class GPU since it’s not a larger core design than the 480/580 it definitely deserved more than being called ‘a 580 rebadge’ perhaps RX 580+ or RX 585 would have been more fitting and easier to digest. 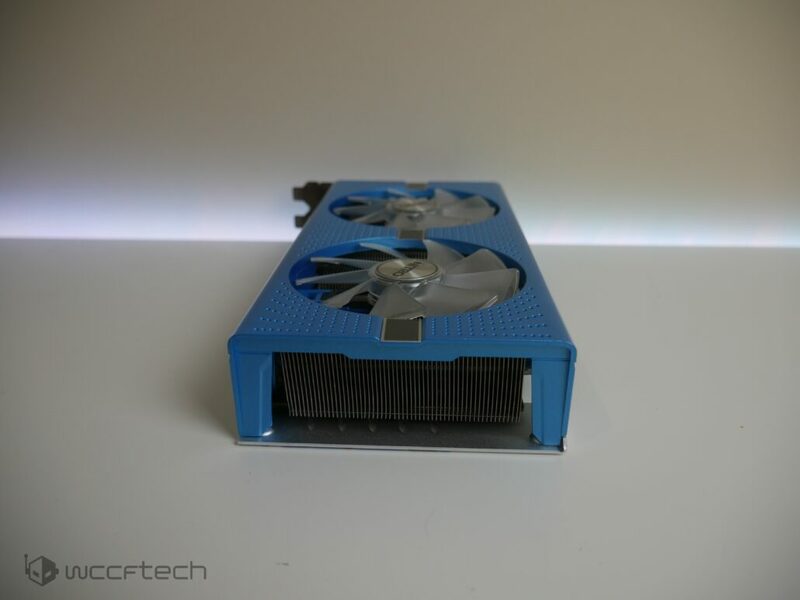 But with that gripe out of the way the SAPPHIRE Nitro + Radeon RX 590 pumps out enough performance to completely dominate the sub $300 market in sheer performance expectations. 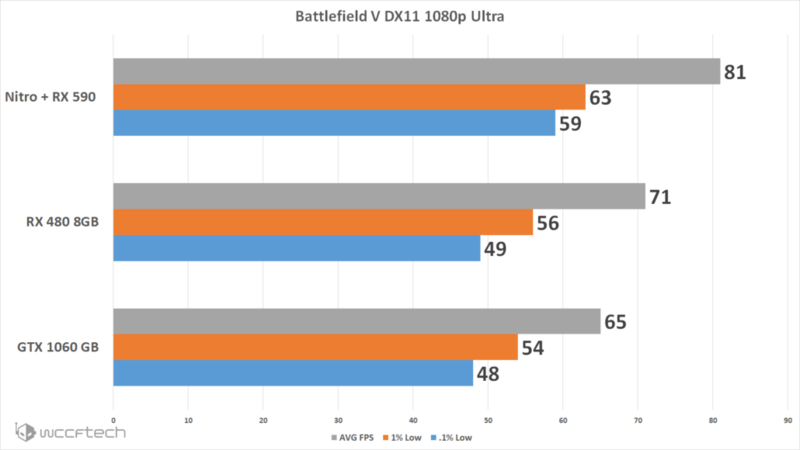 There are still reasons to consider the GTX 1060 6GB, but they’re slimmer than ever and the RX 590 can be tweaked to be just as efficient as Pascal and still match it in performance while being cooler and rocking Freesync capable monitors at a much more reasonable total package cost than the competition. 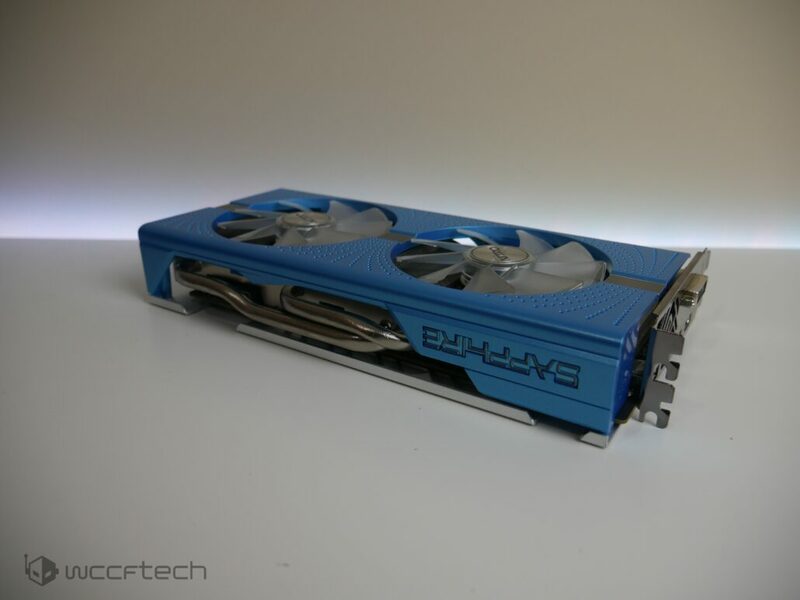 SAPPHIRE has one again created a solid card, even if the Elvis Blue is a bit off putting, can we get a blackout model guys? Please. What About The Game Bundle? All of which are shaping up to be great titles, but it’ll be some time before you can actually get your hands on any of them as they don’t launch for a while. This is a definite value add and if you’re interested in or looking to pick up one of these titles the total package is more than worth the consideration. I just don’t feel that a limited time bundle should change the overall score of the card, if it was a permanent addition then yes. But for now it’s a very good value add for buyers. For under $300 you simply can't get more performance and pair that with a high refresh rate 1080p Freesync display and you've got a killer combination. While the default voltage is aggressive and leads to high power consumption it can easily be mitigated within the Radeon Software. But come on SAPPHIRE, can we get it in black too?